← 2016–Change in Direction Already!!! I decided that participating in the One Monthly Goal (OMG) linky party would be beneficial support/accountability to help me reach my goal of making four 12 1/2″ unfinished blocks each month for my Terra Australis quilt using fabric from Emma Jean Jansen’s Terra Australis and Terra Australis 2 collections. Below is a pic of this fabric before I cut into it. In January I completed the first four blocks of the 25 I will need, and if I get four more blocks done each month, I should have 24 completed by the end of June. And if I am THAT close to meeting my goal, I will be so excited and may even have all 25 sewn by then, rather like the horse picking up speed returning to the stable! I’m taking Jeni Baker’s Mastering the Half-Square Triangle workshop at Quilt-Con, and we will be making (or at least starting) four HST blocks that just so happen to be the size I am using for my Terra Australis quilt. Yay! It is so cool when something you did not plan on actually makes your life a little easier. So making and finishing the four HST blocks from Jeni’s workshop is my goal this month for OMG. 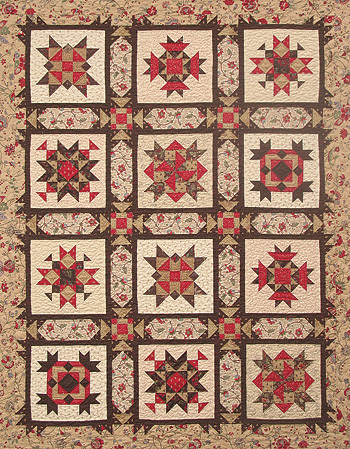 I’m already starting to think about what blocks I will sew in March for my quilt. I found quite a few I like that I saved on a 12-Inch Blocks board on Pinterest. There are at least two I want to make this year from an out-of-print Block of the Month pattern called Paris in the Fall that I ordered directly from the pattern designer, Sheri Falls. And I love the blocks featured in AnneMarie Cheny’s Sister Sampler Quilts book. Other possibilities include blocks from the Modern HST Sampler QAL, The Bee Hive (I already made the beautiful Quatrefoil block for one of my January blocks), and the Sugar Block Club 2016 (in January I made the lovely modern Churn Dash block). So in addition to sewing my four blocks for February, I plan to figure out this month what blocks I will making in March. Linking up to Red Letter Quilts’ OMG. This entry was posted in Quilting, WIP and tagged OMG, Terra Australis. Bookmark the permalink. This is a great goal for the month. I hope you love the workshop! This fabric is so beautiful and all the blocks you have made so far look great. I’m looking forward to seeing the February additions.